Do you like Rice Crispy Treats? Then you'll LOVE this Nutella version! Nutella Crispy Treats are a gourmet version of the favorite childhood treat. Instead of being made with just marshmallows, cereal, and butter, this recipe uses Nutella spread, chocolate chips, and toasted hazelnuts to elevate the snack into a rich, decadent treat. If this recipe has you curious to try more Nutella treats, don't stop here! Try this recipe for Nutella Bars, with a crunchy crust, silky filling, and shiny chocolate glaze. You might also like Nutella Oreo Truffles (super fast and easy!) or this gorgeous and simply recipe for Swirled Nutella Fudge. Place the marshmallows, Nutella, butter, and salt in a large microwave-safe bowl. Microwave it in 30-second intervals, stirring after every 30 seconds to prevent overheating. Heat until the marshmallows and butter are melted and the mixture is smooth. It will be somewhat thick and sticky. Add the cereal, chocolate chips, and toasted hazelnuts to the mix, and stir until everything is well-distributed and coated with the marshmallow mixture. Allow the candy to cool and set at room temperature, for about 45 minutes. To speed things up, you can refrigerate the tray until it is fully chilled and set, if yo udesire. Once set, lift the candy from the pan using the foil as handles. 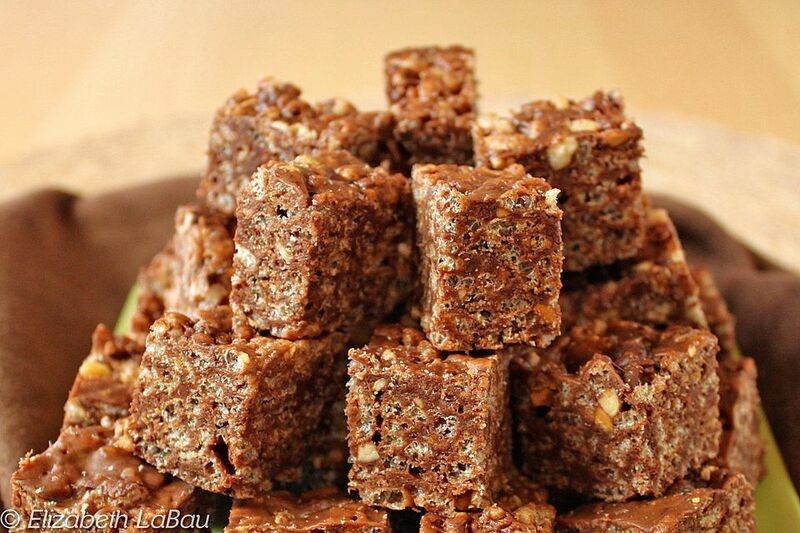 Cut Nutella Crispy Treats into small squares to serve. For the best taste and texture, serve this candy at room temperature. And for added decadence, try dipping the squares either partially or completely in chocolate. Store Nutella Crispy Treats in an airtight container at room temperature for up to a week. Variations: This recipe works with any type of spread, so you can substitute chocolate peanut butter or other nut butters, or even cookie butter! You can also get creative with the mix-ins and add chopped candy, coconut, other nuts, or dried fruit. Finally, consider changing up the type of cereal. Rice crispies are the standard, of course, but you can swap in crunchy flaked cereal (like Frosted Flakes), chocolate crispies, or even Chex-style cereals. Click Here to View All Cereal-Based Candy Recipes!